The basic steps used to conduct marketing research are shown in Figure 10.6 “Steps in the Marketing Research Process”. Next, we discuss each step. The next step in the marketing research process is to do a research design. The research design is your “plan of attack.” It outlines what data you are going to gather and from whom, how and when you will collect the data, and how you will analyze it once it’s been obtained. Let’s look at the data you’re going to gather first. There are two basic types of data you can gather. The first is primary data. Primary data is information you collect yourself, using hands-on tools such as interviews or surveys, specifically for the research project you’re conducting. Secondary data is data that has already been collected by someone else, or data you have already collected for another purpose. Collecting primary data is more time consuming, work intensive, and expensive than collecting secondary data. Consequently, you should always try to collect secondary data first to solve your research problem, if you can. A great deal of research on a wide variety of topics already exists. If this research contains the answer to your question, there is no need for you to replicate it. Why reinvent the wheel? Your company’s internal records are a source of secondary data. So are any data you collect as part of your marketing intelligence gathering efforts. You can also purchase syndicated research. Syndicated research is primary data that marketing research firms collect on a regular basis and sell to other companies. J.D. Power & Associates is a provider of syndicated research. The company conducts independent, unbiased surveys of customer satisfaction, product quality, and buyer behavior for various industries. The company is best known for its research in the automobile sector. One of the best-known sellers of syndicated research is the Nielsen Company, which produces the Nielsen ratings. The Nielsen ratings measure the size of television, radio, and newspaper audiences in various markets. You have probably read or heard about TV shows that get the highest (Nielsen) ratings. (Arbitron does the same thing for radio ratings.) Nielsen, along with its main competitor, Information Resources, Inc. (IRI), also sells businesses scanner-based research. Scanner-based research is information collected by scanners at checkout stands in stores. Each week Nielsen and IRI collect information on the millions of purchases made at stores. The companies then compile the information and sell it to firms in various industries that subscribe to their services. The Nielsen Company has also recently teamed up with Facebook to collect marketing research information. Via Facebook, users will see surveys in some of the spaces in which they used to see online ads (Rappeport, Gelles, 2009). 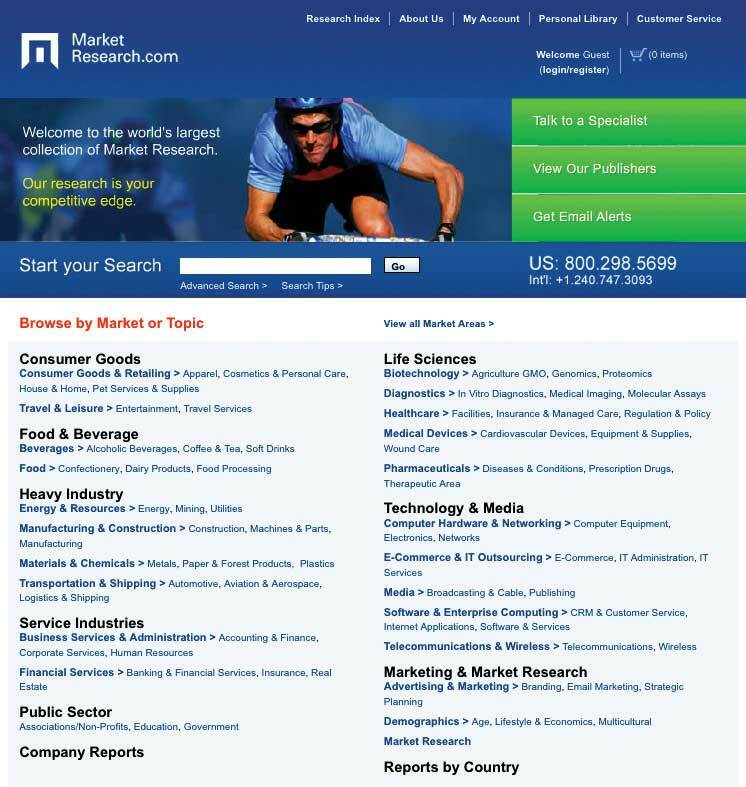 By contrast, MarketResearch.com is an example of a marketing research aggregator. A marketing research aggregator is a marketing research company that doesn’t conduct its own research and sell it. Instead, it buys research reports from other marketing research companies and then sells the reports in their entirety or in pieces to other firms. Check out MarketResearch.com’s Web site. As you will see there are a huge number of studies in every category imaginable that you can buy for relatively small amounts of money. The Survey Research Center at the University of Michigan also conducts periodic surveys and publishes information about trends in the United States. One research study the center continually conducts is called the “Changing Lives of American Families” (http://www.isr.umich.edu/home/news/research-update/2007-01.pdf). This is important research data for marketing managers monitoring consumer trends in the marketplace. The World Bank and the United Nations are two international organizations that collect a great deal of information. Their Web sites contain many free research studies and data related to global markets. Table 10.1 “Examples of Primary Data Sources versus Secondary Data Sources” shows some examples of primary versus secondary data sources. An exploratory research design is useful when you are initially investigating a problem but you haven’t defined it well enough to do an in-depth study of it. Perhaps via your regular market intelligence, you have spotted what appears to be a new opportunity in the marketplace. You would then do exploratory research to investigate it further and “get your feet wet,” as the saying goes. Exploratory research is less structured than other types of research, and secondary data is often utilized. One form of exploratory research is qualitative research. Qualitative research is any form of research that includes gathering data that is not quantitative, and often involves exploring questions such as why as much as what or how much. Different forms, such as depth interviews and focus group interviews, are common in marketing research. The depth interview—engaging in detailed, one-on-one, question-and-answer sessions with potential buyers—is an exploratory research technique. However, unlike surveys, the people being interviewed aren’t asked a series of standard questions. Instead the interviewer is armed with some general topics and asks questions that are open ended, meaning that they allow the interviewee to elaborate. “How did you feel about the product after you purchased it?” is an example of a question that might be asked. A depth interview also allows a researcher to ask logical follow-up questions such as “Can you tell me what you mean when you say you felt uncomfortable using the service?” or “Can you give me some examples?” to help dig further and shed additional light on the research problem. Depth interviews can be conducted in person or over the phone. The interviewer either takes notes or records the interview. Focus groups and case studies are often utilized for exploratory research as well. A focus group is a group of potential buyers who are brought together to discuss a marketing research topic with one another. A moderator is used to focus the discussion, the sessions are recorded, and the main points of consensus are later summarized by the market researcher. Textbook publishers often gather groups of professors at educational conferences to participate in focus groups. However, focus groups can also be conducted on the telephone, in online chat rooms, or both, using meeting software like WebEx. The basic steps of conducting a focus group are outlined below. A case study looks at how another company solved the problem that’s being researched. Sometimes multiple cases, or companies, are used in a study. Case studies nonetheless have a mixed reputation. Some researchers believe it’s hard to generalize, or apply, the results of a case study to other companies. Nonetheless, collecting information about companies that encountered the same problems your firm is facing can give you a certain amount of insight about what direction you should take. In fact, one way to begin a research project is to carefully study a successful product or service. Completing cartoons is yet another type of projective technique. It’s similar to finishing a sentence or story, only with the pictures. People are asked to look at a cartoon such as the one shown in Figure 10.8 “Example of a Cartoon-Completion Projective Technique”. 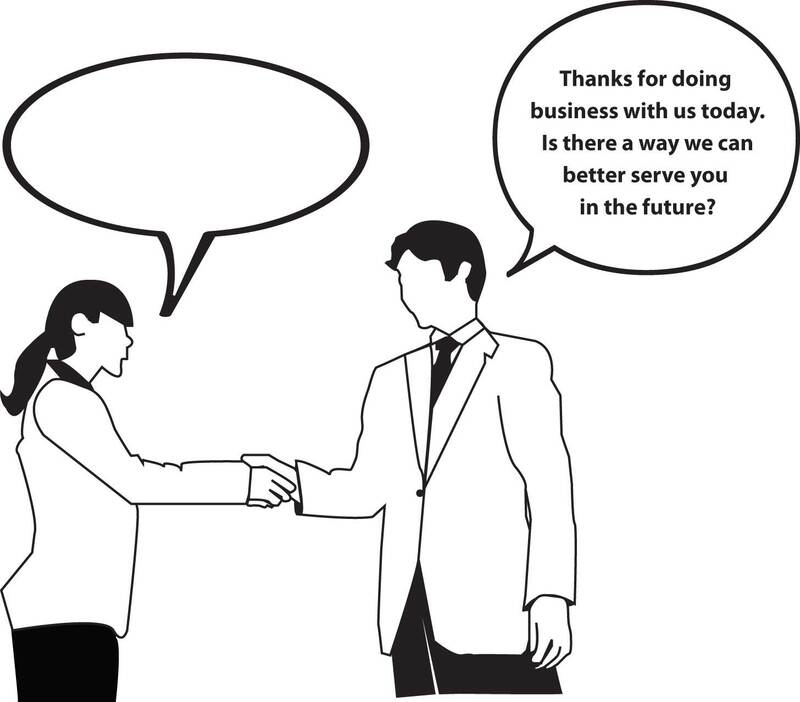 One of the characters in the picture will have made a statement, and the person is asked to fill in the empty cartoon “bubble” with how they think the second character will respond. Anything that can be observed and counted falls into the category of descriptive research design. A study using a descriptive research design involves gathering hard numbers, often via surveys, to describe or measure a phenomenon so as to answer the questions of who, what, where, when, and how. “On a scale of 1–5, how satisfied were you with your service?” is a question that illustrates the information a descriptive research design is supposed to capture. Physiological measurements also fall into the category of descriptive design. Physiological measurements measure people’s involuntary physical responses to marketing stimuli, such as an advertisement. Elsewhere, we explained that researchers have gone so far as to scan the brains of consumers to see what they really think about products versus what they say about them. Eye tracking is another cutting-edge type of physiological measurement. It involves recording the movements of a person’s eyes when they look at some sort of stimulus, such as a banner ad or a Web page. The Walt Disney Company has a research facility in Austin, Texas, that it uses to take physical measurements of viewers when they see Disney programs and advertisements. The facility measures three types of responses: people’s heart rates, skin changes, and eye movements (eye tracking) (Spangler, 2009). 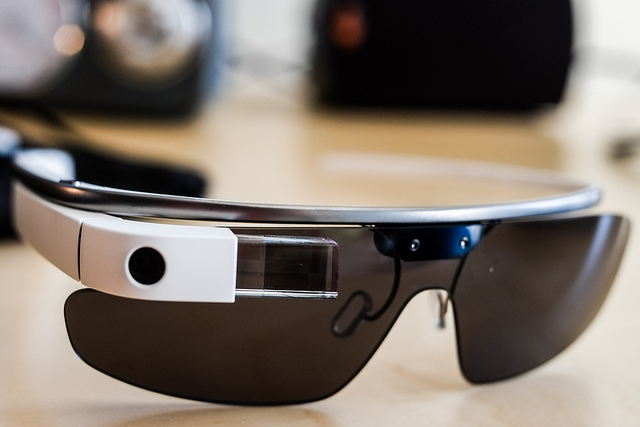 lawrencegs – Google Glass – CC BY 2.0. A strictly descriptive research design instrument—a survey, for example—can tell you how satisfied your customers are. It can’t, however, tell you why. Nor can an eye-tracking study tell you why people’s eyes tend to dwell on certain types of banner ads—only that they do. To answer “why” questions an exploratory research design or causal research design is needed (Wagner, 2007). Causal research design examines cause-and-effect relationships. Using a causal research design allows researchers to answer “what if” types of questions. In other words, if a firm changes X (say, a product’s price, design, placement, or advertising), what will happen to Y (say, sales or customer loyalty)? To conduct causal research, the researcher designs an experiment that “controls,” or holds constant, all of a product’s marketing elements except one (or using advanced techniques of research, a few elements can be studied at the same time). The one variable is changed, and the effect is then measured. Sometimes the experiments are conducted in a laboratory using a simulated setting designed to replicate the conditions buyers would experience. Or the experiments may be conducted in a virtual computer setting. Why is being able to control the setting so important? Let’s say you are an American flag manufacturer and you are working with Walmart to conduct an experiment to see where in its stores American flags should be placed so as to increase their sales. Then the terrorist attacks of 9/11 occur. In the days afterward, sales skyrocketed—people bought flags no matter where they were displayed. Obviously, the terrorist attacks in the United States would have skewed the experiment’s data. An experiment conducted in a natural setting such as a store is referred to as a field experiment. Companies sometimes do field experiments either because it is more convenient or because they want to see if buyers will behave the same way in the “real world” as in a laboratory or on a computer. The place the experiment is conducted or the demographic group of people the experiment is administered to is considered the test market. Before a large company rolls out a product to the entire marketplace, it will often place the offering in a test market to see how well it will be received. For example, to compete with MillerCoors’ sixty-four-calorie beer MGD 64, Anheuser-Busch recently began testing its Select 55 beer in certain cities around the country (McWilliams, 2009). 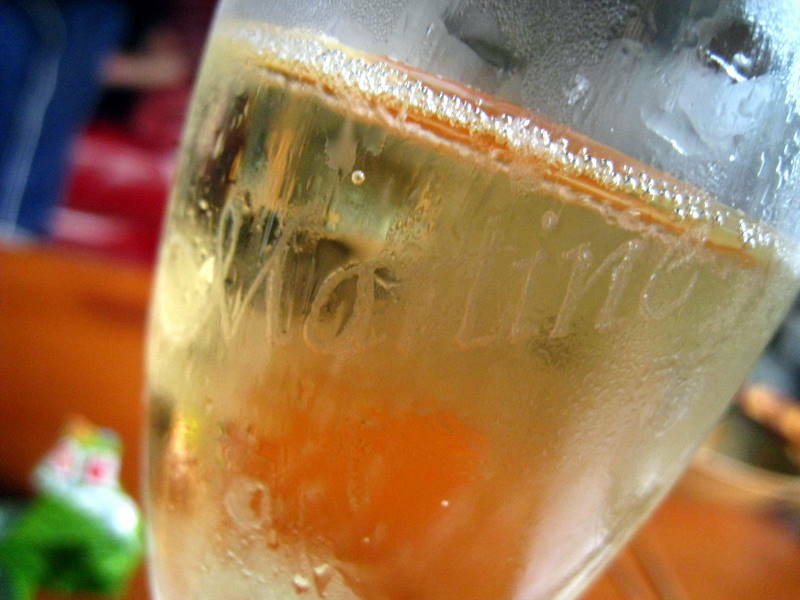 Martine – Le champagne – CC BY-NC 2.0. Many companies use experiments to test all of their marketing communications. For example, the online discount retailer O.co (formerly called Overstock.com) carefully tests all of its marketing offers and tracks the results of each one. One study the company conducted combined twenty-six different variables related to offers e-mailed to several thousand customers. The study resulted in a decision to send a group of e-mails to different segments. The company then tracked the results of the sales generated to see if they were in line with the earlier experiment it had conducted that led it to make the offer. How the questions themselves are worded is extremely important. It’s human nature for respondents to want to provide the “correct” answers to the person administering the survey, so as to seem agreeable. Therefore, there is always a hazard that people will try to tell you what you want to hear on a survey. 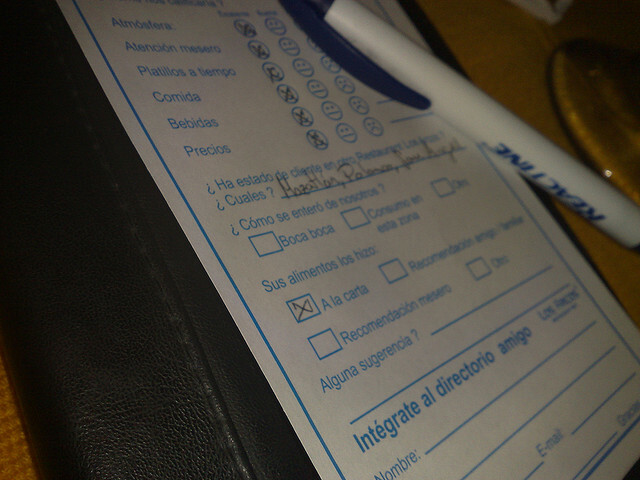 Consequently, care needs to be taken that the survey questions are written in an unbiased, neutral way. In other words, they shouldn’t lead a person taking the questionnaire to answer a question one way or another by virtue of the way you have worded it. The following is an example of a leading question. Which brand of toothpaste have you used at home in the past six months? If you have used more than one brand, please list each of them1. Other research question “don’ts” include using jargon and acronyms that could confuse people. “How often do you IM?” is an example. Also, don’t muddy the waters by asking two questions in the same question, something researchers refer to as a double-barreled question. “Do you think parents should spend more time with their children and/or their teachers?” is an example of a double-barreled question. Open-ended questions, or questions that ask respondents to elaborate, can be included. However, they are harder to tabulate than closed-ended questions, or questions that limit a respondent’s answers. Multiple-choice and yes-and-no questions are examples of closed-ended questions. You have probably heard the phrase “garbage in, garbage out.” If the questions are bad, the information gathered will be bad, too. One way to make sure you don’t end up with garbage is to test the questionnaire before sending it out to find out if there are any problems with it. Is there enough space for people to elaborate on open-ended questions? Is the font readable? To test the questionnaire, marketing research professionals first administer it to a number of respondents face to face. This gives the respondents the chance to ask the researcher about questions or instructions that are unclear or don’t make sense to them. The researcher then administers the questionnaire to a small subset of respondents in the actual way the survey is going to be disseminated, whether it’s delivered via phone, in person, by mail, or online. Once you have created your questionnaire or other marketing study, how do you figure out who should participate in it? Obviously, you can’t survey or observe all potential buyers in the marketplace. Instead, you must choose a sample. A sample is a subset of potential buyers that are representative of your entire target market, or population being studied. Sometimes market researchers refer to the population as the universe to reflect the fact that it includes the entire target market, whether it consists of a million people, a hundred thousand, a few hundred, or a dozen. “All unmarried people over the age of eighteen who purchased Dirt Devil steam cleaners in the United States during 2011” is an example of a population that has been defined. Obviously, the population has to be defined correctly. Otherwise, you will be studying the wrong group of people. Not defining the population correctly can result in flawed research, or sampling error. A sampling error is any type of marketing research mistake that results because a sample was utilized. One criticism of Internet surveys is that the people who take these surveys don’t really represent the overall population. On average, Internet survey takers tend to be more educated and tech savvy. Consequently, if they solely constitute your population, even if you screen them for certain criteria, the data you collect could end up being skewed. The next step is to put together the sampling frame, which is the list from which the sample is drawn. The sampling frame can be put together using a directory, customer list, or membership roster (Wrenn et. al., 2007). Keep in mind that the sampling frame won’t perfectly match the population. Some people will be included on the list who shouldn’t be. Other people who should be included will be inadvertently omitted. It’s no different than if you were to conduct a survey of, say, 25 percent of your friends, using friends’ names you have in your cell phone. Most of your friends’ names are likely to be programmed into your phone, but not all of them. As a result, a certain degree of sampling error always occurs. There are two main categories of samples in terms of how they are drawn: probability samples and nonprobability samples. A probability sample is one in which each would-be participant has a known and equal chance of being selected. The chance is known because the total number of people in the sampling frame is known. For example, if every other person from the sampling frame were chosen, each person would have a 50 percent chance of being selected. A nonprobability sample is any type of sample that’s not drawn in a systematic way. So the chances of each would-be participant being selected can’t be known. A convenience sample is one type of nonprobability sample. It is a sample a researcher draws because it’s readily available and convenient to do so. Surveying people on the street as they pass by is an example of a convenience sample. The question is, are these people representative of the target market? Of course, if you hire a marketing research company, much of this work will be taken care of for you. Many marketing research companies, like ResearchNow, maintain panels of prescreened people they draw upon for samples. In addition, the marketing research firm will be responsible for collecting the data or contracting with a company that specializes in data collection. Data collection is discussed next. As we have explained, primary marketing research data can be gathered in a number of ways. Surveys, taking physical measurements, and observing people are just three of the ways we discussed. If you’re observing customers as part of gathering the data, keep in mind that if shoppers are aware of the fact, it can have an effect on their behavior. For example, if a customer shopping for feminine hygiene products in a supermarket aisle realizes she is being watched, she could become embarrassed and leave the aisle, which would adversely affect your data. To get around problems such as these, some companies set up cameras or two-way mirrors to observe customers. Organizations also hire mystery shoppers to work around the problem. A mystery shopper is someone who is paid to shop at a firm’s establishment or one of its competitors to observe the level of service, cleanliness of the facility, and so forth, and report his or her findings to the firm. A face-to-face survey is, of course, administered by a person. The surveys are conducted in public places such as in shopping malls, on the street, or in people’s homes if they have agreed to it. In years past, it was common for researchers in the United States to knock on people’s doors to gather survey data. However, randomly collected door-to-door interviews are less common today, partly because people are afraid of crime and are reluctant to give information to strangers (McDaniel & Gates, 1998). By contrast, gathering survey data collected by a computer, either over the telephone or on the Internet, can be very cost-effective and in some cases free. SurveyMonkey and Zoomerang are two Web sites that will allow you to create online questionnaires, e-mail them to up to one hundred people for free, and view the responses in real time as they come in. For larger surveys, you have to pay a subscription price of a few hundred dollars. But that still can be extremely cost-effective. The two Web sites also have a host of other features such as online-survey templates you can use to create your questionnaire, a way to set up automatic reminders sent to people who haven’t yet completed their surveys, and tools you can use to create graphics to put in your final research report. To see how easy it is to put together a survey in SurveyMonkey, click on the following link: http://help.surveymonkey.com/app/tutorials/detail/a_id/423. Ricardo Rodriquez – Satisfaction survey – CC BY-NC-ND 2.0. And how do you figure out whom to research in foreign countries? That in itself is a problem. In the United States, researchers often ask if they can talk to the heads of households to conduct marketing research. But in countries in which domestic servants or employees are common, the heads of households aren’t necessarily the principal shoppers; their domestic employees are (Malhotra). One way companies try to deal with translation problems is by using back translation. When back translation is used, a native speaker translates the survey into the foreign language and then translates it back again to the original language to determine if there were gaps in meaning—that is, if anything was lost in translation. And it’s not just the language that’s an issue. If the research involves any visual images, they, too, could be a point of confusion. Certain colors, shapes, and symbols can have negative connotations in other countries. For example, the color white represents purity in many Western cultures, but in China, it is the color of death and mourning (Zouhali-Worrall, 2008). Also, look back at the cartoon-completion exercise in Figure 10.8 “Example of a Cartoon-Completion Projective Technique”. What would women in Muslim countries who aren’t allowed to converse with male sellers think of it? Chances are, the cartoon wouldn’t provide you with the information you’re seeking if Muslim women in some countries were asked to complete it. Once all the data is collected, the researchers begin the data cleaning, which is the process of removing data that have accidentally been duplicated (entered twice into the computer) or correcting data that have obviously been recorded wrong. A program such as Microsoft Excel or a statistical program such as Predictive Analytics Software (PASW, which was formerly known as SPSS) is then used to tabulate, or calculate, the basic results of the research, such as the total number of participants and how collectively they answered various questions. The programs can also be used to calculate averages, such as the average age of respondents, their average satisfaction, and so forth. The same can done for percentages, and other values you learned about, or will learn about, in a statistics course, such as the standard deviation, mean, and median for each question. The two most commonly used criteria used to test the soundness of a study are (1) validity and (2) reliability. A study is valid if it actually tested what it was designed to test. For example, did the experiment you ran in Second Life test what it was designed to test? Did it reflect what could really happen in the real world? If not, the research isn’t valid. If you were to repeat the study, and get the same results (or nearly the same results), the research is said to be reliable. If you get a drastically different result if you repeat the study, it’s not reliable. The data collected, or at least some it, can also be compared to, or reconciled with, similar data from other sources either gathered by your firm or by another organization to see if the information seems on target. Every study has errors—sampling errors, interviewer errors, and so forth. The methodology section should explain these details, so decision makers can consider their overall impact. The margin of error is the overall tendency of the study to be off kilter—that is, how far it could have gone wrong in either direction. Remember how newscasters present the presidential polls before an election? They always say, “This candidate is ahead 48 to 44 percent, plus or minus 2 percent.” That “plus or minus” is the margin of error. The larger the margin of error is, the less likely the results of the study are accurate. The margin of error needs to be included in the methodology section. Recommendations. The recommendations section should outline the course of action you think should be taken based on the findings of the research and the purpose of the project. For example, if you conducted a global market research study to identify new locations for stores, make a recommendation for the locations (Mersdorf, 2009). 1“Questionnaire Design,” QuickMBA, http://www.quickmba.com/marketing/research/qdesign (accessed December 14, 2009). Barnes, B., “Disney Expert Uses Science to Draw Boy Viewers,” New York Times, April 15, 2009, http://www.nytimes.com/2009/04/14/arts/television/14boys.html?pagewanted=1&_r=1 (accessed December 14, 2009). Burns A. and Ronald Bush, Marketing Research, 6th ed. (Upper Saddle River, NJ: Prentice Hall, 2010), 85. Malhotra, N., Marketing Research: An Applied Approach, 6th ed. (Upper Saddle River, NJ: Prentice Hall), 764. McDaniel, C. D. and Roger H. Gates, Marketing Research Essentials, 2nd ed. (Cincinnati: South-Western College Publishing, 1998), 61. McWilliams, J., “A-B Puts Super-Low-Calorie Beer in Ring with Miller,” St. Louis Post-Dispatch, August 16, 2009, http://www.stltoday.com/business/next-matchup-light-weights-a-b-puts-super-low-calorie/article_47511bfe-18ca-5979-bdb9-0526c97d4edf.html (accessed April 13, 2012). Mersdorf, S., “How to Organize Your Next Survey Report,” Cvent, August 24, 2009, http://survey.cvent.com/blog/cvent-survey/0/0/how-to-organize-your-next-survey-report (accessed December 14, 2009). Rappeport A. and David Gelles, “Facebook to Form Alliance with Nielsen,” Financial Times, September 23, 2009, 16. Spangler, T., “Disney Lab Tracks Feelings,” Multichannel News 30, no. 30 (August 3, 2009): 26. Wagner, J., “Marketing in Second Life Doesn’t Work…Here Is Why!” GigaOM, April 4, 2007, http://gigaom.com/2007/04/04/3-reasons-why-marketing-in-second-life-doesnt-work (accessed December 14, 2009). Wrenn, B., Robert E. Stevens, and David L. Loudon, Marketing Research: Text and Cases, 2nd ed. (Binghamton, NY: Haworth Press, 2007), 180. Zouhali-Worrall, M., “Found in Translation: Avoiding Multilingual Gaffes,” CNNMoney.com, July 14, 2008, http://money.cnn.com/2008/07/07/smallbusiness/language_translation.fsb/index.htm (accessed December 14, 2009). 10.2 Steps in the Marketing Research Process by [Author removed at request of original publisher] is licensed under a Creative Commons Attribution-NonCommercial-ShareAlike 4.0 International License, except where otherwise noted.